Stoke enter the 2013/14 season with a lot more uncertainty than has surrounded the club for many years. Long-time manager, Tony Pulis, ended his second spell with the club after seven years, leaving fellow Welsh man, Mark Hughes, to step into the hot seat. Pulis led the club through an unprecedented spell of success, yet by the end of his reign, Stoke fans had grown vocally opposed to the club’s direct style of play. As a result, Hughes and his players will be under pressure from the first kick off to not only improve results, but also bring a more expressive brand of football to the Potteries. More than anything though, Stoke need to re-establish the Britannia as a fortress, after being nowhere near as dominant at home last year. Mark Hughes arrives in Stoke with a point to prove. With a resume as a player that could only be matched by Michael Laudrup among current Premier League managers, Hughes will instantly command the respect of many of the key figures in his dressing room. Following his glittering playing career, Hughes had a relatively successful spell as manager of the Welsh national team, before four years at Blackburn Rovers where they consistently overachieved. Following his success at Blackburn, Hughes was given the Manchester City job. Despite providing solid results for 16 months, the club’s oil-rich owners decided that they’d had enough and replaced Hughes with Roberto Mancini. Hughes next job was at Fulham, where he resigned after an impressive single season stating that the owners ambitions did not match his own, and this was followed by a disastrous spell at QPR. 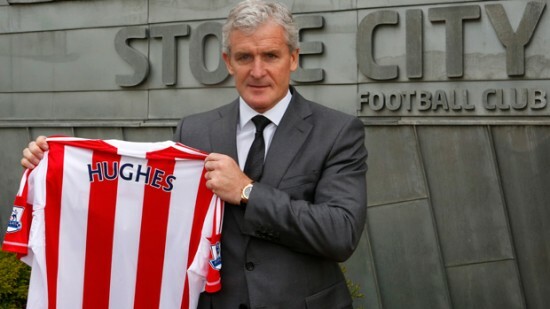 So, Hughes lands in Stoke knowing that he is running out of opportunities to salvage his once lofty managerial reputation. Entering into his 7th season with the club, Club Captain, Ryan Shawcross, is undoubtedly one of the key figures around the Britannia. Having signed as a promising youngster from Manchester United, (who were so reluctant to sell him that they insisted on a buy back clause in the deal), Shawcross has progressed dramatically year on year. 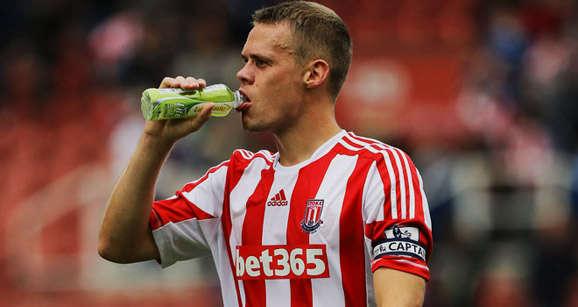 Having been capped by England, Shawcross has developed a reputation as one of the better central defenders in the league and has been key to Stoke’s success in recent years. If Stoke are to change their style this season, Shawcross will need to be an instigator. An accomplished passer for a centre back, he was often the man designated to distribute the ball from back to front in one foul swoop. If Hughes is to initiate a change in culture watch out for Shawcross to be finding his central midfielders and full backs with his passes rather than sending the ball over their heads. According to our predictions, Stoke will survive to play another season in the Premier League, but only just. Their gradual decline in recent years is possibly a result of things becoming stale at the club. 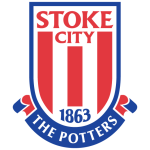 Although Mark Hughes offers a new voice for the players to respond to, the worry for Stoke fans is that they are relying upon the same group of players and complacency may well have set in. Having met a number of players on a visit to the Britannia last January, I’m still struck by one particular big name player complaining about it being “too cold to play football” while signing autographs for a small group of fans. Stoke went on to lose 4-0 in the match that followed and the player in question was anonymous. Familiarity has created a comfort zone for Stoke. In spite of this a key factor in Stoke picking up points will be their strength in depth in goal. 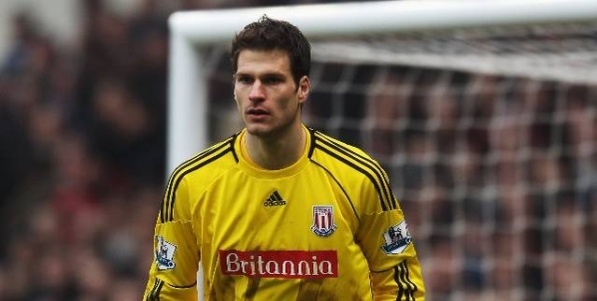 They are lucky enough to have arguably the best combination of goalkeepers in the league with the highly coveted Bosnian star, Asmir Begovic (pictured above), Danish veteran, Thomas Sorensen, and English wonderkid, Jack Butland. 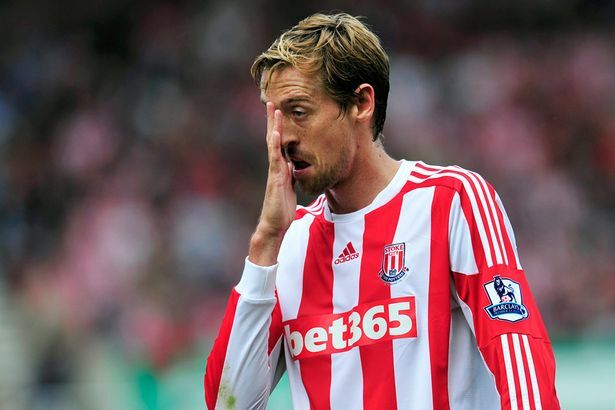 They also have the ever reliable Peter Crouch (pictured below) to score his fair share of goals. Come May, expect the passionate folk of the Potteries to be sounding out “Delilah”, with a mixture of relief and defiance.